In the US, just 20% of students learn another language. There are many advantages to learning a second language. Some are fairly obvious. If you find yourself lost in a foreign country, being able to express yourself clearly could help lead you to your destination. Similarly, if your job requires you to travel you may find it easier to vault language and cultural barriers. But there are other benefits that are not so immediately apparent. For example, learning another language could improve your all-round cognitive ability. It could help hone your soft skills, and even increase your mastery of your mother tongue, too. The languages of the internet. Some studies have apparently identified a link between being multilingual and fending off the onset of dementia. Others indicate that being able to speak more than one language can help you become better at multitasking in other aspects of your daily life, too. Deciding on which additional language or languages to learn is often a matter of chance and personal preference. Maybe you have a parent or grandparent who is a native of another country, so you were brought up being able to speak their language. Perhaps your family regularly took vacations in a particular foreign country when you were a child and that sparked your interest. Or it could just be that you had a very engaging teacher who instilled in you a love for languages. But deciding whether to learn one at all would appear to be determined more by your mother language than anything else. In short, native-born English speakers are far less likely to learn a second language than many other people. In the US, just 20% of students learn a foreign language. Meanwhile, in parts of Europe that figure stands at 100%. Across the whole of Europe the median is 92%, and is at least 80% in 29 separate European countries investigated by Pew Research. In 15 of those 29, it’s 90% or more. Down under, around 21% of people can use a second language, although only 73% of Australian households identified as English-speaking in the 2016 census. In Canada, only 6.2% of people speak something other than the country’s two official languages, English and French. In the UK, fewer school students are studying languages to exam levels at ages 16 or 18. Since 2013, the numbers of studying a language at GCSE level – the end of secondary schooling examination taken by most 16-year-olds in England, Wales and Northern Ireland - have fallen between 30% and 50%. Scotland has its own exam system but the drop off in language study is comparable. The UK has a long-standing tradition of teaching French and German at secondary school level, although not always with tremendous success: Brits are not famed for their multilingual skills. However, the popularity of both those languages has plummeted in UK schools. Less than 20 years ago, just 2,500 students were taking a language other than French, German, Spanish or Welsh – which is a mandatory curriculum requirement in Wales. But by 2017, according to numbers acquired by the BBC, that had shot up to 9,400. Two languages that are growing in popularity in the UK are Spanish and Chinese, the BBC found. Chinese, of course, is the most widely spoken language in the world. However, in the online sphere it’s a close second to English. 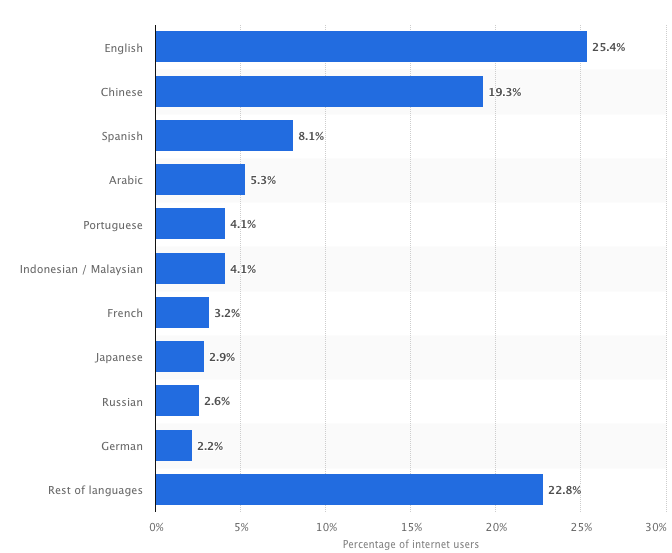 Online, English is used by 25.4% of people. For Chinese, it’s 19.3%. Both are way ahead of third-placed Spanish which is used by 8.1% of internet users.